It's not yet finished, but here's a beta of a user style I'm working on to locally restore the old theme for the CQFF. 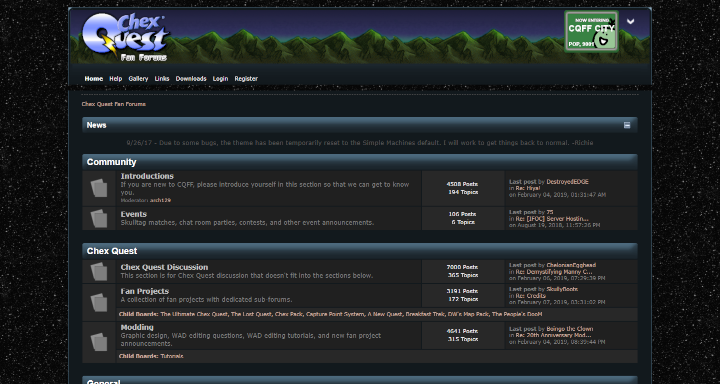 Then, go to https://userstyles.org/styles/168797/old-theme-for-chex-quest-fan-forums and hit "Install Style". Hit OK on the box that opens up, and you're good to go! If for some reason that doesn't work, go to https://pastebin.com/Axme9saH and copy the code from there. Then, open the CQFF, go into your addon's settings, hit "Write Style for chexquest.org" (or equivalent button - it varies) and paste the code you copied in the last step. Now click save and party like it's 2017! The only problem I have is that the typing box is messed up. This might have typos because of that. Other than that, I like it! Been a while since it looked like this. Would you mind sending me a screenie of the typing box? I probably won't get to fixing it until this weekend, but I'd like this user style to be as close to the original as possible. Look at the attached image. What's your browser and OS versions? Try using the addon link for Pale Moon. I'll see what I can do over the weekend. BTW, I'd never heard of LTSB until now. I'm definitely gonna check that out over my break next week! Would you be interested in restoring the original theme at the software level, so that a browser extension is not required? The theme broke a couple of years back, forcing me to go to Simple Machines default. I haven't had the time since to restore it. Let me know if you're interested and I'll give you access. I have next week off, so I guess I could see what I can do. I'd be honored, really. What exactly was it that broke? If I am remembering correctly, we were using a re-colorized version of the Simple Machines default theme. This theme was modified with our custom theme graphics. Eventually, the theme broke. Stuff like that happens sometimes with this forum software. I had to revert back to the standard default. Never got around to adding all our graphics back in. It would be nice to see the theme restored.